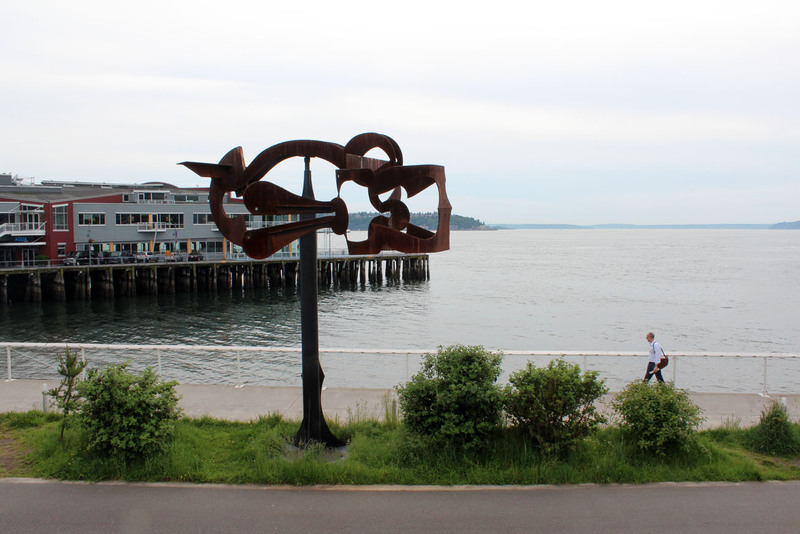 SEATTLE—One of the most visually stunning attractions in Seattle is the Olympic Sculpture Park located downtown on the waterfront. If you have visited other major sculpture parks and gardens, the art on display is relatively standard fare, but the park itself—its location and how its sited—is pretty incredible. 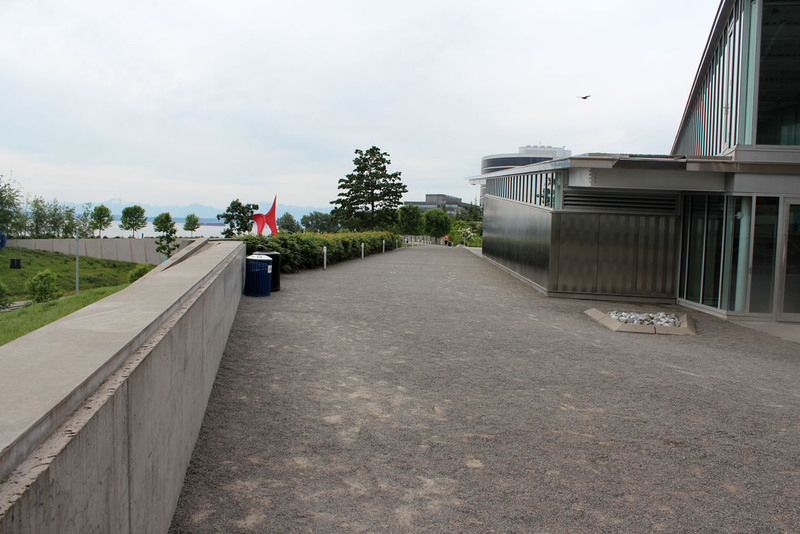 Exterior view of Olympic Sculpture Park pavilion. 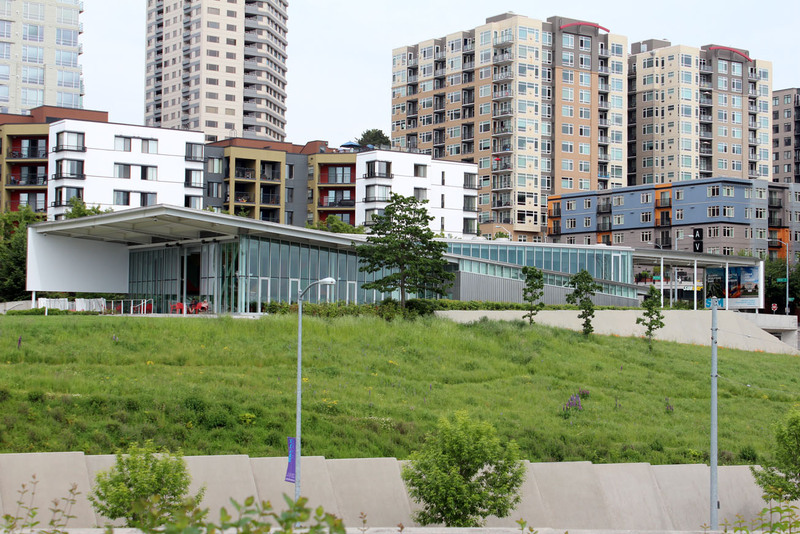 The main entrance to the free public park is at street level, its highest point. 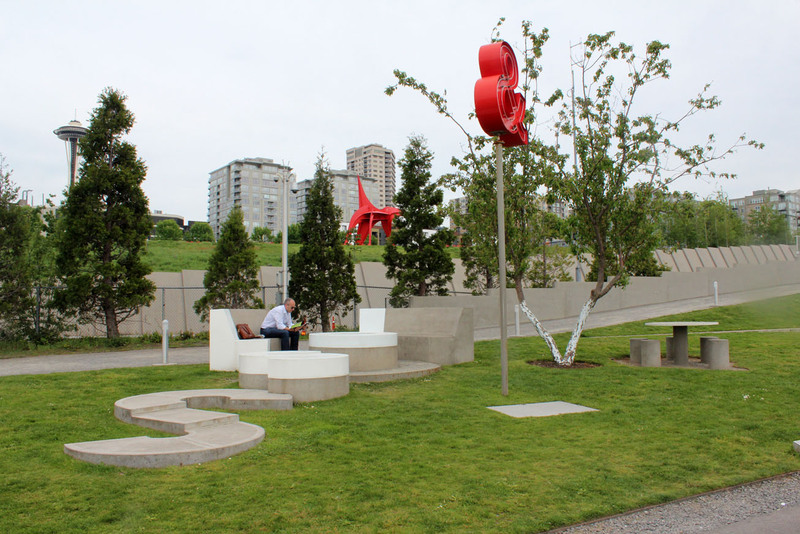 You enter through a contemporary pavilion, where “Seven Cubes” by Sol Lewitt is currently on view, and then head out to the landscaped, multilevel park with views of Pugent Sound and the Olympic Mountains (hence the name of the park). 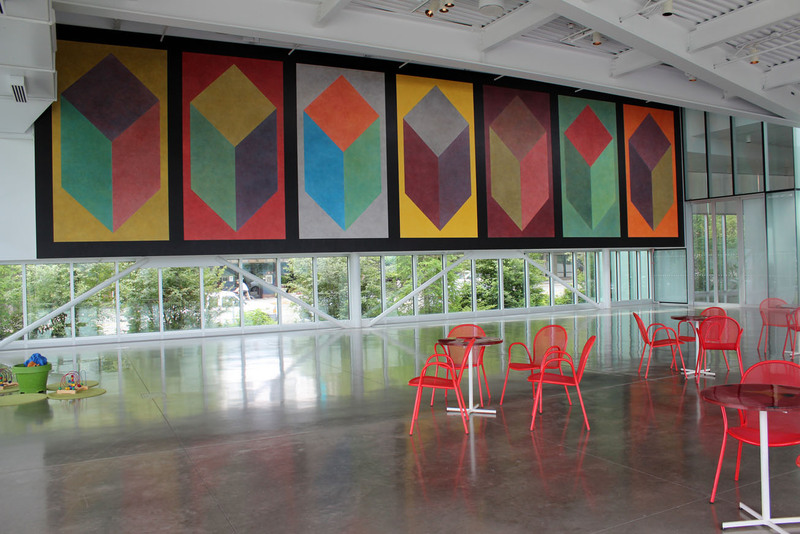 “Seven Cubes” by Sol Lewitt is currently on view in the sculpture park pavilion. 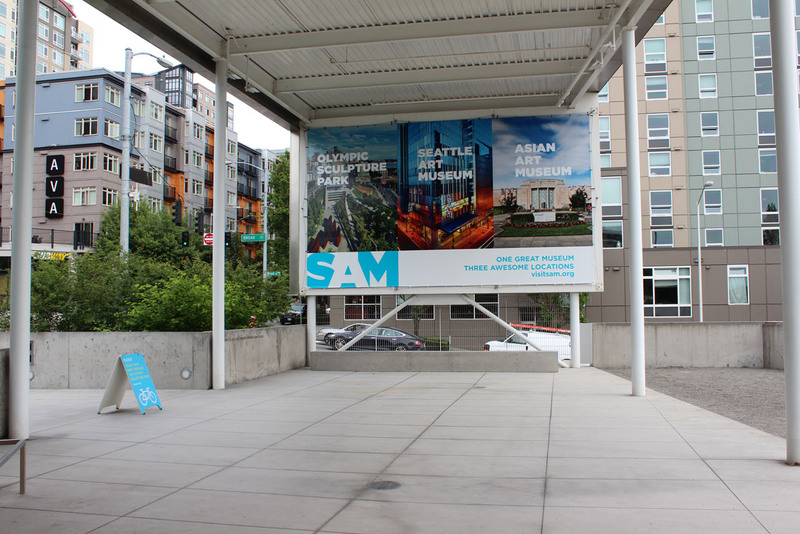 Owned and maintained by the Seattle Art Museum, the park slices across a highway, train tracks and descends down to the waterfront. Designed by Weiss/Manfredi architects, the property creates a unique environment for the art to engage with the landscaping, topography and extensive views. 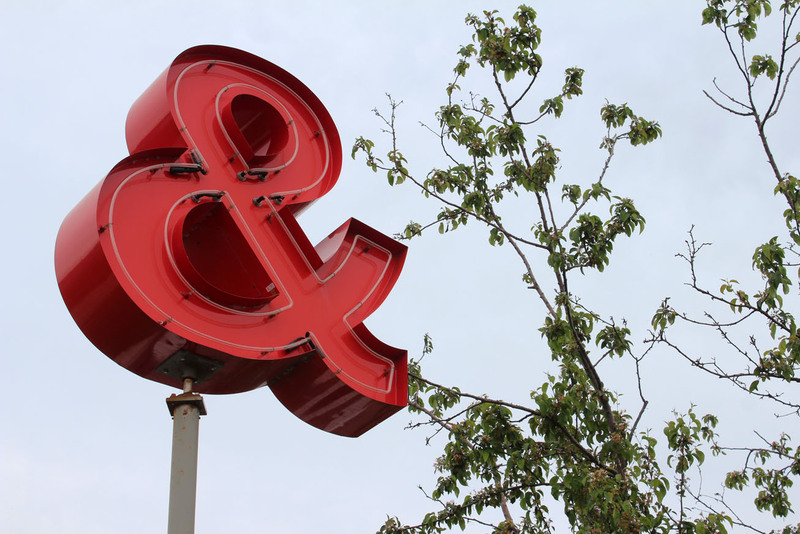 Works by Alexander Calder, Mark di Suvero, Louise Nevelson, Beverly Pepper and Claes Oldenburg, among a few others, are exhibited in the park. Three sculptures stand out. 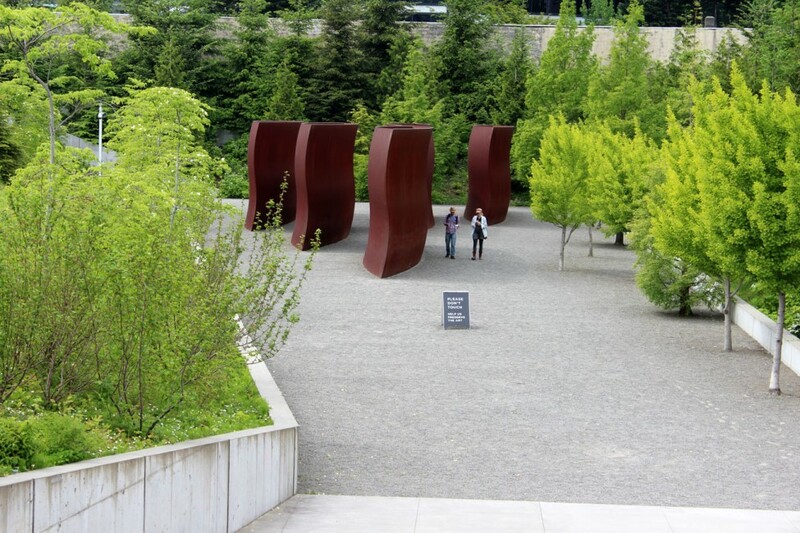 Installation views of “Wake,” 2004 (weathering steel) by Richard Serra. An installation by Richard Serra is a must-see (above). Typical of Serra’s work, as simple as it appears, the sculpture offers incredibly diverse perspectives from various angles and vantage points. 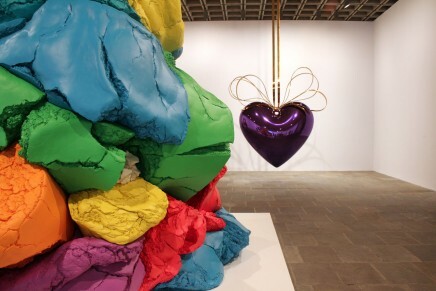 Detail of “Love & Loss” by Roy McMakin. Installation view of “Love & Loss,” 2005-2006 (mixed-media installation with benches, table, live tree, pathways and illuminated rotating element) by Roy McMakin. 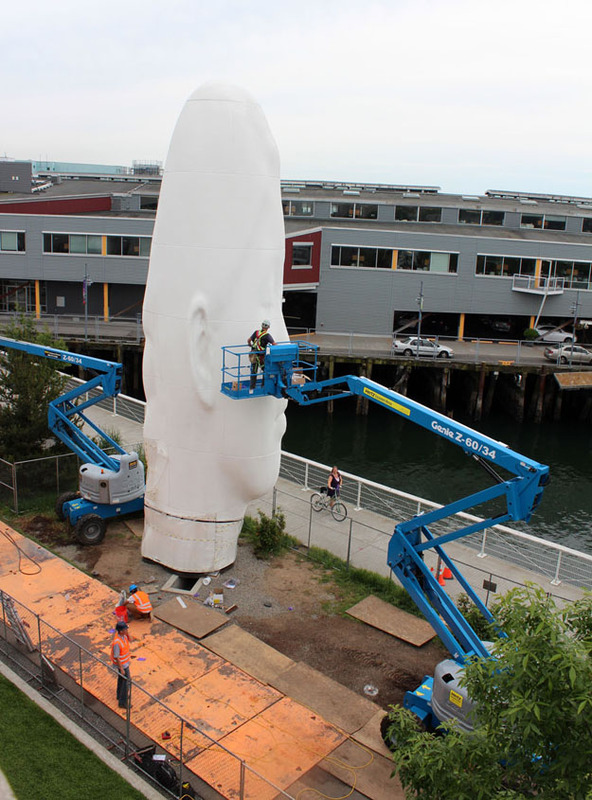 “Echo” by Jaume Plensa in the process of being installed on May 15. 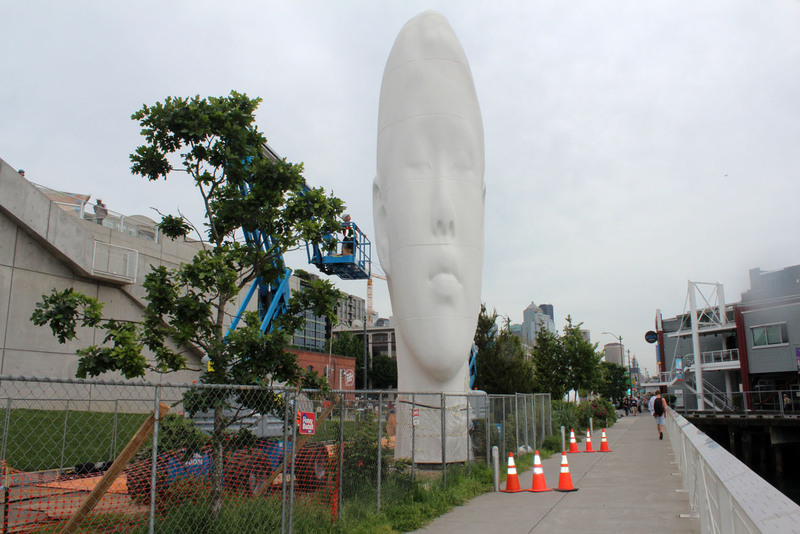 And on the day I visited, Jaume Plensa’s stunning “Echo” head sculpture (above) was being installed and officially went on view May 29. I witnessed the end of the process. It was fascinating to see the tall, narrow head, which is composed of sections, being situated by men in cherry pickers. The sculpture is so bright and white that it appears to glow and seems like it is photo-shopped into the landscape. 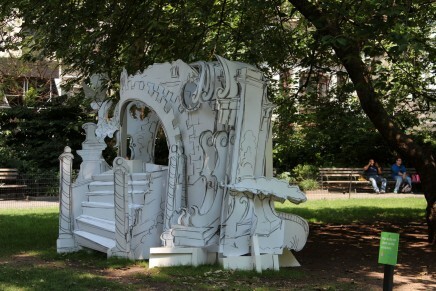 Images of the park facilities and a selection of featured works follows. 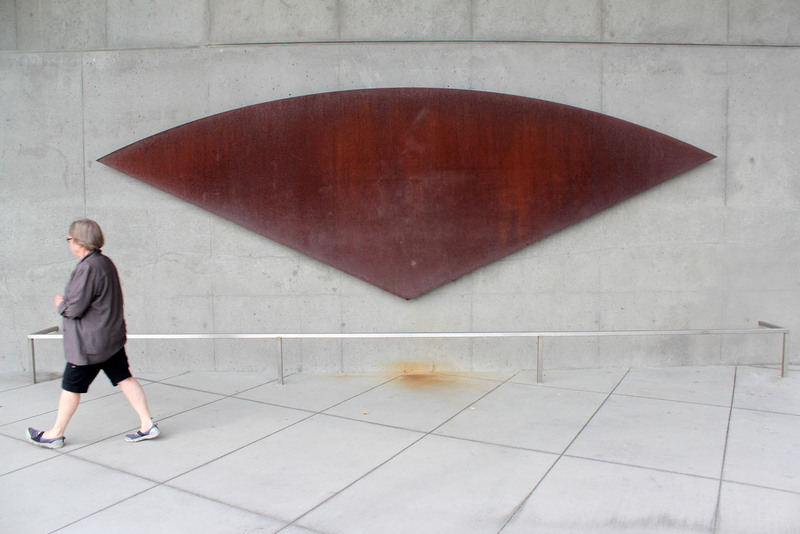 “Curve XXIV,” (Cor-Ten stell) by Ellsworth Kelly, is on display at the entrance to the park pavilion. The street-level entrance to the park leads to descending planes of green space, with Calder’s “The Eagle” in the distance. 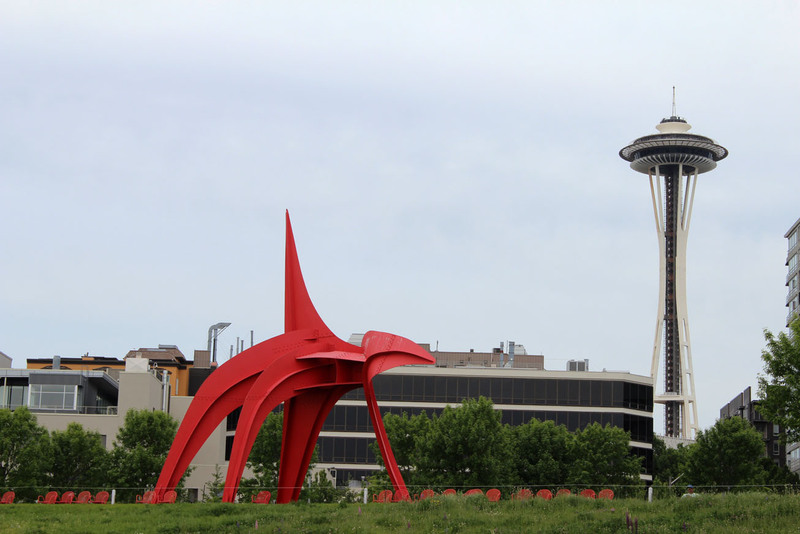 “The Eagle,” 1971 (painted steel) by ALexander Calder, with the Space Needle in the background. 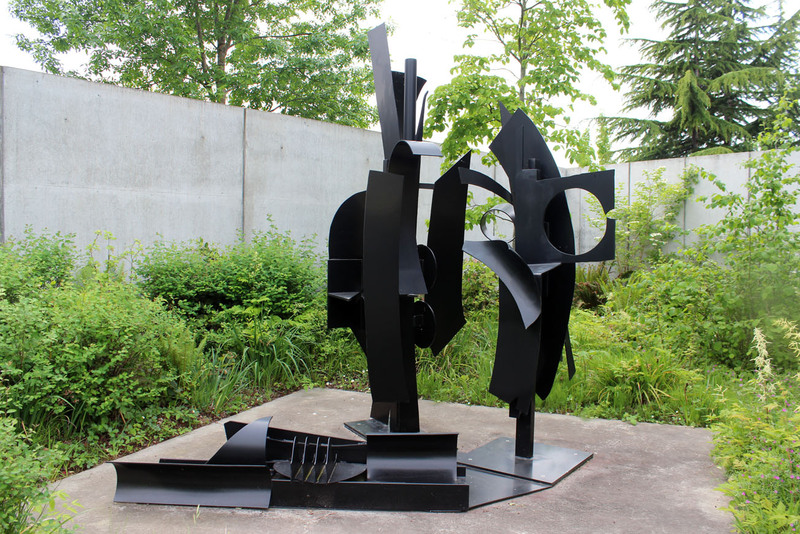 “Sky Landscape I,” 1976 (aluminum, painted black) by Louise Nevelson. 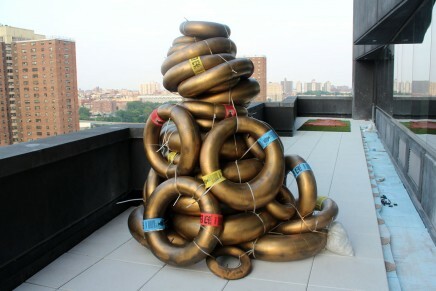 Installation views of “Typewriter Eraser, Scale X,” model 1998, fabricated 1999 (stainless steel and fiberglass painted acrylic urethane) by Claes Oldenburg. “Bunyon’s Chess,” 1965 (stainless steel and wood) by Mark di Suvero. 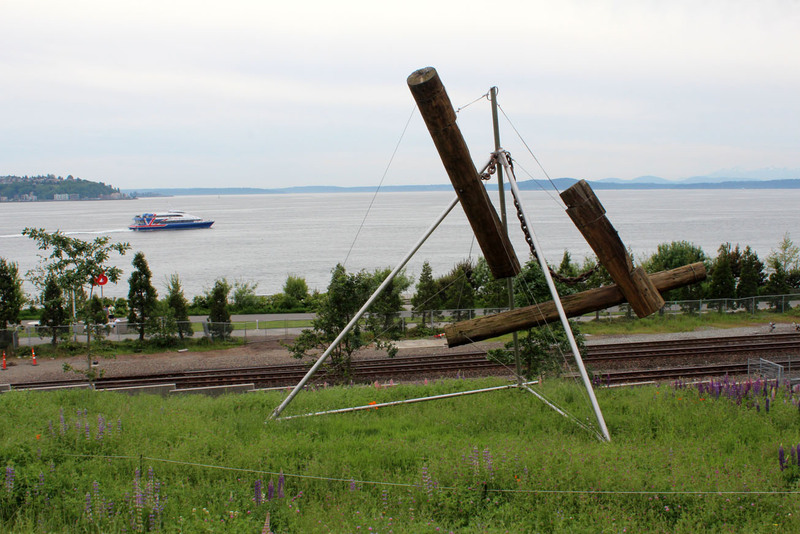 “Schubert Sonata,” 1992 (steel, painted and unpainted) by Mark di Suvero. Installation views of “Perre’s Ventaglio III,” 1967 (stainless steel and enamel) by Beverly Pepper. “Echo,” 2011 (polyester resin and marble dust, with a steel framework) by Jaume Plensa. The nearly 46-foot-tall sculpture (above) by Spanish artist Plensa was originally commissioned by the Madison Park Association and first exhibited in Madison Square Park in New York. On June 16, 2014, Plensa is giving an artist talk at The Art Institute of Chicago.